FC Barcelona and Toulouse FC reached an agreement for the French player Jean-Clair Todibo, around €2 million, with whom the club had previously agreed to bring over in the summer. However, the young French defender will be joining the Blaugrana immediately and will his deal with the club will seem him through the end of the 2022-2023 season and was given the number six shirt. Jean-Clair Todibo was born in Cayenne, the capital of French Guiana in South America, on December 30, 1999. He played for the FC Les Lilas club at the youth level before joining Toulouse FC in 2016. He made his first team debut at the beginning of the season and has made 10 appearances for the French club this season, all of them as a starter. Barça also completed the winter transfer window period by agreeing to sign 20-year-old Brazilian right-back Emerson Aparecido Leite de Souza Junior, known as Emerson, from Atletico Mineiro for €12 million. The Brazil Under-20 international, who has made 23 appearances for Mineiro, will spend the rest of this season on-loan at Real Betis before joining Barça in the summer. This has been the busiest winter window period in the club’s history. 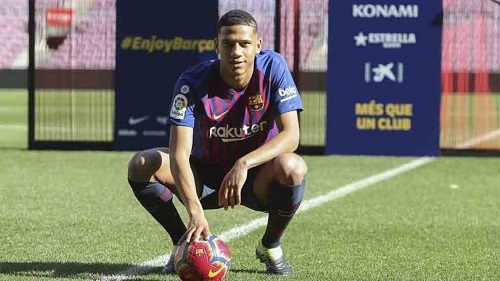 Besides announcing the signing of Frenkie de Jong for the upcoming season, Barça brought in defenders Todibo, Murillo (on loan) and forward Kevin-Prince Boateng (on loan). Barça also saw the departures of Munir and Denis Suarez as they joined Sevilla and Arsenal. Also, Borussia Dortmund made Paco Alcacer’s transfer permanent, by agreeing to pay Barça €23 million plus a further €5 million in variable payments, along with 5% transfer fee should Dortmund sell the player in the future. Previous PostBarça demolish Sevilla 6-1 to advance to Copa Semi-Finals. Next PostBarça to face Real Madrid in Copa del Rey Semi-Finals without Jasper Cillessen.